If you or your family is advised a surgery or a medical procedure, then. Take time & call at *70266 46022* or send ur medical reports at *medical@medisense.me* or else visit at *medisensehealth.com* They will get u a 2nd opinion from an expert doctors panel. It is a free service for patients. This free service for patients is available in *45cities across 20 states in India*.. This service is applicable to only cases which involves surgery or major medical procedures. You will receive responses in the form of Email. Hence it is important to fill correct Email Id and Mobile Number. All the information provided by you will remain confidential. It will be shared only with panel of doctors. Please upload the reports so that doctors can arrive at the appropriate opinion. Questions to the doctor should be clearly articulated below. when providing brief description, please specify your health conditions,existing medications and symptoms,if any. If you have an emergency, please visit the nearest hospital immediately. IMPORTANT: Only Email Opinion is FREE. Other services like personal consultation, telephonic consultation & Skype consultation is chargeable. whether the line of treatment is correct? Who is the right doctor for me in my locality, in my state, in my country ? 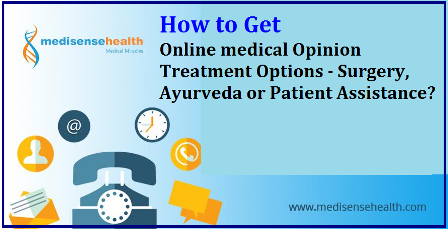 How to avail Online Medical Opinion ? Fill the medical opinion form. Our system has the algorithm to sense who is the right doctor and hospital for you. If your query is categorized as a paid query then complete the payment through a secured link using paypal (International patients) and PayTM (Indian Patients). Your case file is referred to the doctor. Once doctor responds you will get Opinion mail. In the opinion mail, you have an option to a)Talk to the doctor b)Meet the doctor 3)Get opinion from another expert or 4)Thank the doctor. If you choose to get treated at the hospital, you will be provided travel, Visa support, get credit points, which can be used during consultations. Click Down For more details ..